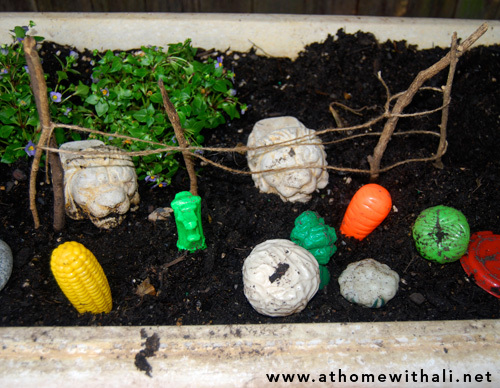 Welcome to part 3 of the Small Garden Spaces For Kids Series. 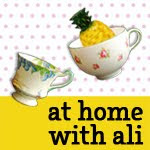 If you are new to this series you can take a look here to see what it is all about. Today I am featuring our mud garden which came into being when Cakey ran out into the garden holding her spade and proclaimed "there is nowhere to dig". Chris had done such a good job of creating a thriving garden that there were no bare patches of dirt for her to play in anymore. We decided to build a mud garden. 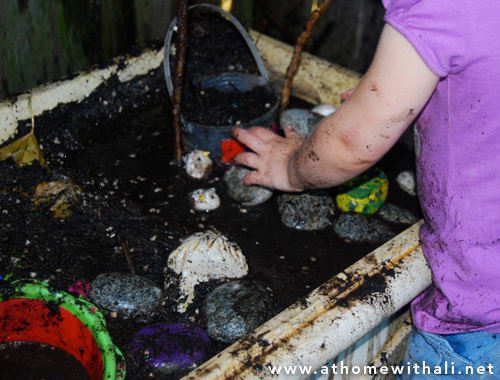 When it came to making our mud garden we had two main considerations – space and soil. We don't have a lot of space and the soil in our garden is full of old building debris. With that in mind, we bought a large rectangular planter box and placed it in the far back corner of the garden. We filled it with new, clean soil (we used a mixture of sand, fine coir peat and potting mix). 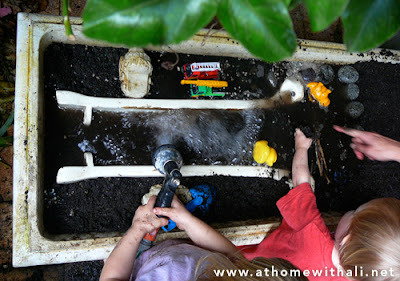 The planter box has good drainage holes at the bottom and is raised off the ground – we knew that the kids would pour a lot of water into the mud garden so drainage is very important. The mud garden gets used for digging and construction, building dams and creating floods, making mud pies and mud soup and loads of fun messy play. I try to keep things interesting by adding different elements – cups, bowls, spoons, plastic vegetables, rocks, sticks, toy cars and open piping to use as a river for flood experiments. We have a small table nearby where the kids can set up their mud creations. I don't have a full mud kitchen established which I would love to do. Making mud soup – yum! 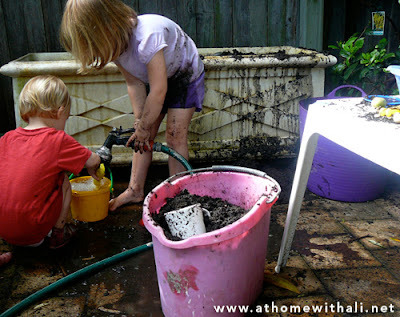 Location, location, location – we positioned our mud garden as far from the house as possible so muddy children don't wander from mud garden to house. 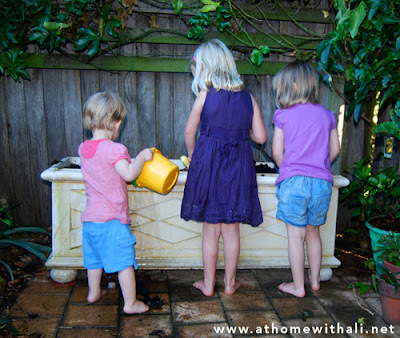 Access to water is important to make those yummy mud pies and to clean the children off after play too. The flipside of that – good drainage is even more critical. You don't want puddles of stagnant water. Having clean soil without chemicals or debris. This might sound a little precious, after all, kids have been digging in the dirt forever but I have a 20 month old who puts everything in her mouth. If you are planning on using your own soil check to see what is in it – you may be surprised at how much old building material is in the soil. Having good access for multiple children. 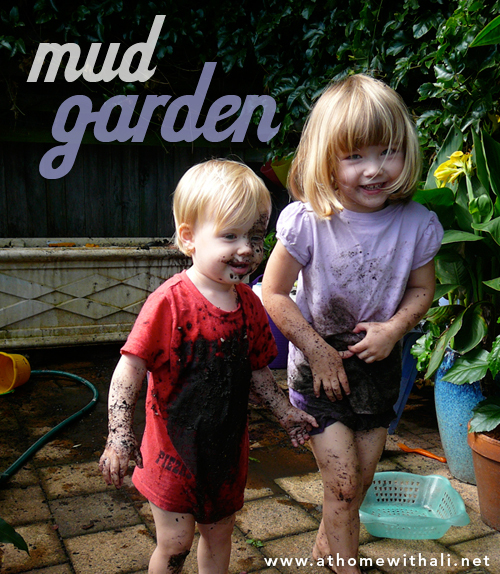 Our mud garden is popular with visitors, we can accommodate four kids comfortably around the mud garden – any more and fights start to break out. Please feel free to let me know if you have a mud garden or outdoor kitchen – email me, leave a link in the comments or on my facebook page. 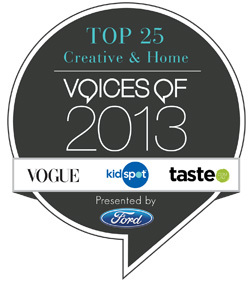 Tomorrow I am featuring a very special part of the garden – a secret kids only play space. This is a wonderful idea. Thank you for the tips! Great tip for you regarding mud gardening...have plastic bags near the door. There is always a moment to make a speedy trip inside to get a band-aid, phone, or bathroom. The bags go right over hands and feet to keep from tracking the dirt inside. Enjoy. We play in the mud, er, garden everyday! We LOVE our mud kitchen! Our mud supply is not as nice as this though, just a small hole in the ground. But we do have a pretty nice kitchen set up outside for them. Couldn't agree with you more about the water. Adding water to their creations might be the favorite part! We have rain barrels so I don't mind that they are constantly going back to the hose for more! Thanks so much for linking this up to the outdoor play party! Your mud garden is so attractive and inviting!! I love the planter box you found for it. We have had easy access to mud since most of our yard used to be dirt patches, so my daughter would make mud by pouring water on the dirt patches. Now, we have relandscaped our yard, so no more dirt patches. My daughter, actually, was sad about the installation of new (fake) grass bc she said, "I don't like grass bc there's no dirt left." So I need to create an area with mud. Your post has inspired me to make this a priority again. Great idea... make sure you have no cats running around the neighborhood though! I do a lot of container planting and have to take care that things are protected from neighborhood cats using them as litter boxes! I love it - what a great idea! I am very inspired to go out and make one of these now for my kids. So nice to see such creative and fun garden ideas.